Kangana Ranaut recently made headlines when she lashed out at Zoya Akhtar and Alia Bhatt for apparently not supporting her recent release Manikarnika – The Queen of Jhansi. Following this, in the recent episode of Signature Masterclass Kangana stated that her previous release Queen had one of the most-lame scripts ever, and that Vikas Bhal was just making the film for fun. Well, though the furore around these episodes is yet to die down, Kangana has set her sights on yet another target. This time attacking veteran actress Shabana Azmi and terming her anti-national. Post the horrific Pulwama attacks, veteran actress Shabana Azmi and Javed Akhtar cancelled their visit to Karachi which was planned for a literature conference to celebrate Azmi's father, the late Kaifi Azmi's writings. 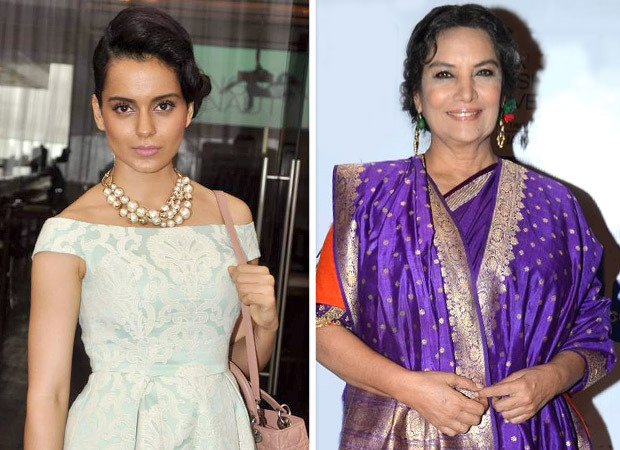 Following this, Kangana reportedly spoke to an entertainment website calling Azmi anti-national and saying that it was people like Shabana Azmi who promote Bharat Tere Tukde Honge gangs. Further venting out at the veteran actress, Kangana also questioned Azmi’s motives behind organizing and attending an event in Karachi when the relations between India and Pakistan continued to remains strained. Concluding her tirade Kangana stated that the industry was full of such anti-nationals who boost enemies' morals in many ways. Following Ranaut’s outburst Shabana Azmi disregarded the matter stating that in light of recent events a personal attack was of no significance, and that currently the entire country stood as one in grief condemning the dastardly Pulwama attack.